One of the things I love about traveling around giving talks at parishes and conferences is meeting old friends. Mark Shea, fellow convert, blogger, speaker and all around fun guy, was free for lunch while I’m here giving talks at Holy Family Parish in Kirkland Washington outside Seattle. 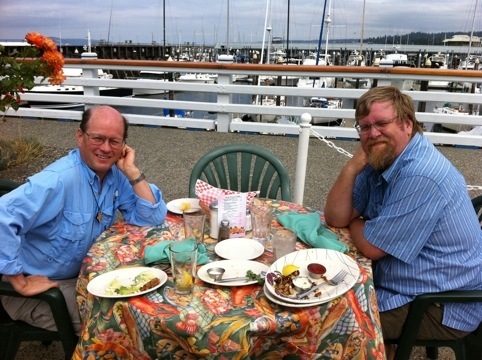 Mark and I went to a great seafood restaurant on the water’s edge on Puget Sound. We were able to catch up on news of our families and ministries and what we’re writing. We also recalled fun memories of working together on the scripts for my Footprints of God DVDs. 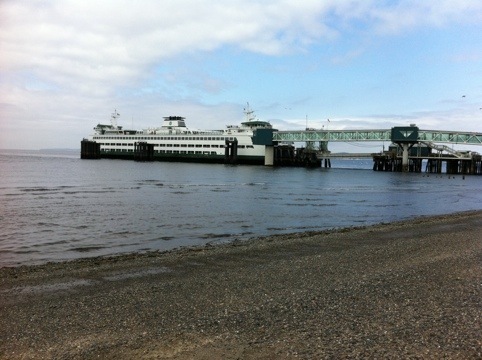 We then walked and talked along the shore with the sea breeze and the sound of ship horns and seagulls. Nice time for sure. Sad to say good-bye. Keep up the good work Mark! Now on the give my final talk at Holy Family parish with Fr. Nagel and the delightful Bob and Pam Gunderson who have befriended me and organized this well-attended and very enthusiastic parish mission. My talk tonight is about fish! The title is ” Swimming Upstream: Living the Christian Life in a Neo-pagan World”. I begin by discussing the life of salmon. Frs. 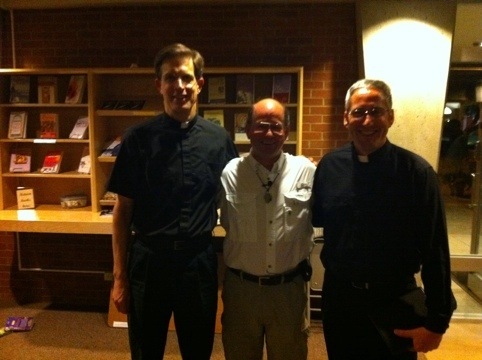 Nagle and Northrop who sponsored my talks in Kirkland. What great guys! !